Flowing through extensive parts of South East Forest National Park, Towamba River stretches some 86km in length continuing down to the northern boundary of Mount Imlay National Park and consists of 12 tributaries. Towamba is located on the far south coast of New South Wales with a catchment area of about 2,345km2. The majority of the population is located within the coastal towns of Tathra, Merimbula, Pambula and Eden. The population of these towns increases several fold during summer holidays, creating a significant demand on town water supplies. 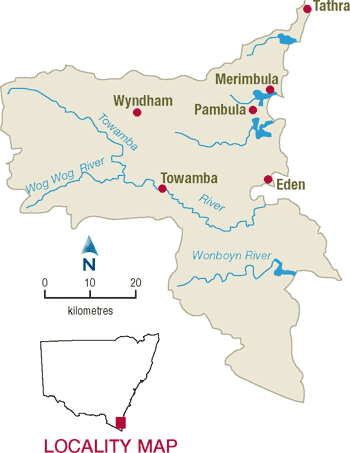 The Towamba River catchment is bound by the Bega catchment to the north, the Snowy catchment to the west and the Genoa catchment to the south. View real-time data from the Towamba catchment on this website. The Towamba River Basin is unregulated - there are no major storages to capture and control flows. Local water utilities, conservation, forestry and cattle grazing. The greatest agricultural demand for water is stock water and small scale irrigation of lucerne. There are also a small number of horticultural properties for which irrigation water is required for fruit and vegetable production, and for orchard maintenance. Since there are no major storages to capture and control flows, most water users rely on natural flows or small structures, such as weirs for their water supplies. As in most unregulated rivers, flows are most affected during relatively dry times, when water is low and demand is high. The management of lands along river and creek banks is an important issue that can affect water flow and quality. For example, cattle grazing can damage sensitive riverbank vegetation resulting in erosion, and forestry can reduce rainfall run-off into rivers, creeks and streams. 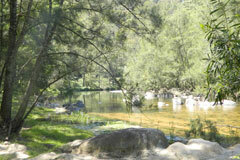 Like much of the NSW south coast, the Towamba catchment has a relatively high density of estuaries and coastal lakes. There are 10 ecologically significant ICOLLs - Intermittently closed and open lakes and lagoons. They include Wallagoot Lake, Merrica Lake, Nadgee Estuary and Nadgee Lake, and two ecologically significant estuaries - Towamba and Wonboyn, in the Towamba catchment.